Review: More than likely had I not seen Earth to Echo at an advance screening for critics it would have been a film I wouldn’t have thought twice about missing in the theater…and probably would have skipped entirely when it popped up on Netflix or Amazon Prime. I purposely hadn’t watched a trailer for it beforehand, relishing the rare opportunity in this day and age to go into a film having not been inundated with trailers and a marketing blitz that spoiled some surprises. All I knew about this sci-fi adventure aimed at 8-12 year old boys was that it was funded (and, once production had been completed, subsequently dropped by Walt Disney Studios) and that it reminded me an awful lot of 80s fare like The Goonies, *batteries not included, Explorers, E.T., and a host of other films that I grew up with. 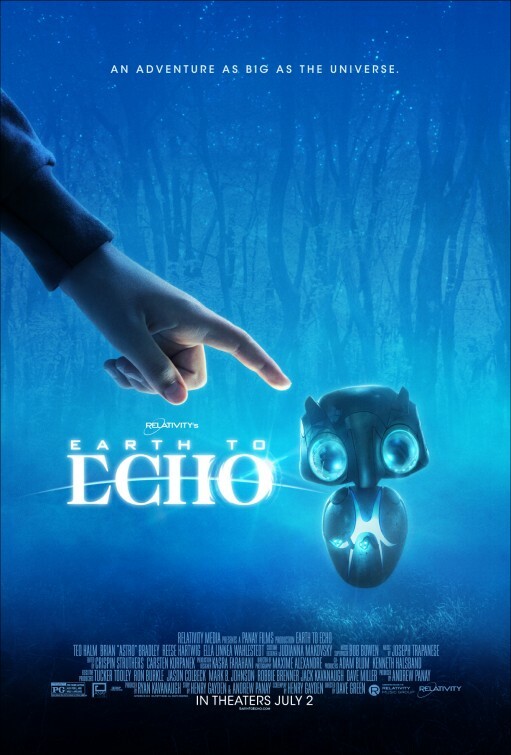 While Earth to Echo isn’t breaking box office records after being unceremoniously dumped into theaters right in the middle of this blockbuster heavy season, it’s one of the more pleasing summer entries so far in 2014. Scoring high on sheer nostalgia factor alone, I couldn’t shake the feeling throughout that this was the kind of film I would have gobbled up back in the day. The overly familiar plot finds three friends from a small Nevada development that’s being razed for a freeway expansion using their last days together digging into the mystery of why their phones seem to be pointing them to a spot in the desert. On their final night in their homes they take off on their BMXs (with helmets on, in one of the film’s several safety first messages) and discover a cute as all get out alien that needs their help to get back home. Employing a found footage technique that works more than it should, Earth to Echo makes decent use out of its short running length to find time to discuss friendship, loss, and family without shoving it down the throats of the young audience (and their parents) it’s targeting. If the acting feels a tad on the amateur side (especially with the unfortunate late addition of a tween girl, introduced seemingly because the producers realized they needed to attract girls as well as boys) it’s because we’re dealing with mostly green actors that compensate for their lack of experience with a few nice moments of genuine sincerity. Though it continues the trend of pushing the limits of the family-friendly PG rating with a fair share of perilous sequences, this is a nice little nugget of a film. Even if the credits play over the too on the nose “Counting Stars” by OneRepublic, it manages to bridge the gap for parents of youngsters that are too old for silly animation and too young for those PG-13 comedies that have at least one scene that makes you regret you brought your 10 year old.